Not long ago we announced the release of our brand new Dovecraft collection, Make a Wish! 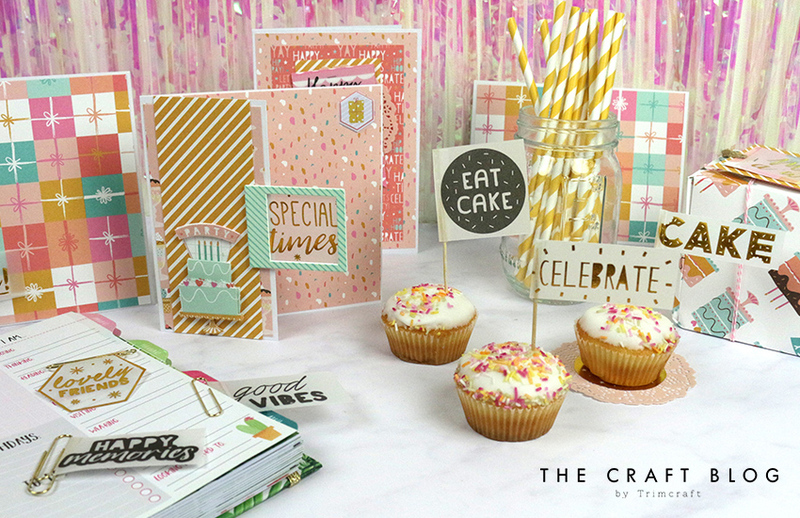 Featuring fun party-themed illustrations and pretty pastel colours, this collection was an instant hit with you across our blog and social media. One element of this new range, however, especially caught your eye – the new Vellum Quote Pad! Featuring 192 sentiments in a variety of typefaces and styles, with some featuring stunning gold foil, the vellum quote pad is perfect for adding a cool, contemporary touch to your makes as well as a thoughtful sentiment. First off, we’re showing you how to create this beautiful celebration card that any of your family or friends would be delighted to receive! We love how the vellum pad has been used as the focal point on this particular card. What’s particularly great about any of the Dovecraft collections is that all of the papers and embellishments have been created with coordination in mind, which makes creating stunning papercrafts so simple. This card is a perfect example of how these collections work together to make something that is so pretty, so easily! 1. Take your card blank and cut the front to measure 8cm wide. 2. Cut a 14.5cm square piece of backing paper from the Make a Wish paper pack. We chose this pretty pink confetti design. 3. Next, adhere a 7.5 x 14.5cm piece of Make a Wish paper to the front of your card blank, layering it with a complementing design measuring 5cm x 15cm. 4. Cut your chosen sentiment from the Vellum Pad and adhere it carefully to the back of your wooden frame. Trim the edges of the vellum pad, if needed. 5. Adhere the thickest side of the frame edge to the front of the card. 6. Make up your chosen decoupage (we chose this beautiful cake design) and adhere it to the bottom front of your card for a touch of added detail. 7. Finish by adding a sticker in the top corner. There you have it! How easy was that?! A stunning card in seven steps. Why not also layer your vellum sentiment over a selection of papers to create this cool and colourful card?! So easy to create, we mat and layered the Make a Wish papers, before adding a doily and a banner cut from another complementing paper design. We then adhered the vellum sentiment to the banner as a finishing touch. Add a stylish finish to your gift tags by adding a vellum sentiment. We’ve attached ours using a stapler, layering a selection of the Make a Wish papers for a cool, contemporary look. These gift tags look great on a handmade gift box – why not make your own from the Make a Wish papers with help from our video tutorial? Add some glamour to your planner and create these cool clips to highlight your special events! We’ve taken a paperclip and adhered the vellum quotes to them to create these – so easy and will help you to remember exciting times. Get your party on with these cool cake toppers! Perfect for any celebration, these are SO easy to create and will add an extra special touch to your treats. What do you think of the Vellum Quote Pad from the Make a Wish collection? We hope that you found lots of inspiration in this post, so don’t forget to let us know your thoughts by leaving us a comment below and to upload your makes to the Inspiration area if you try any! We also love seeing your makes on social media, so please #Trimcraft when uploading so that we can find them.